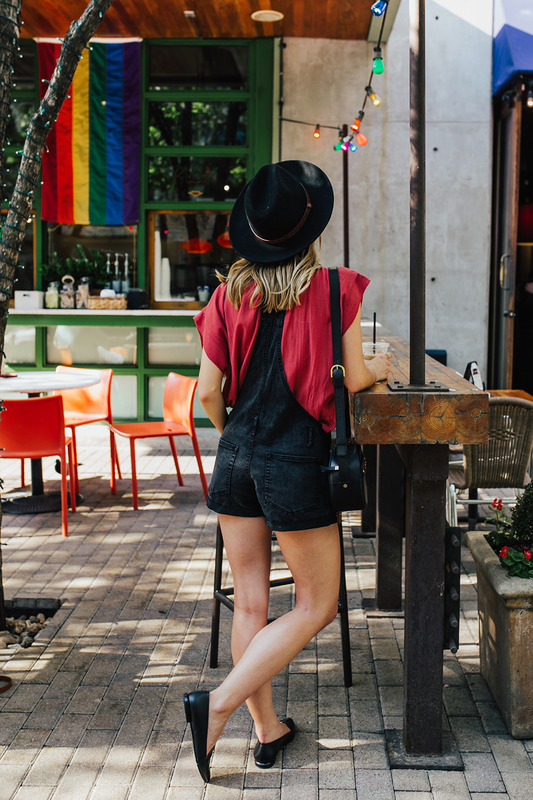 Aaaand my love for overalls (…er, “shortalls”..) continues with this stinkin’ adorable black pair. I didn’t know I could love a 90s trend so much in 2017, but seriously, I never want to take these off. When this pair arrived in the mail last week, I am not even joking when I tell you that I wore these overalls three days in a row. They are SO. COMFY. You can rock them with flats, sneakers, sandals…you name it, they look awesome and just bring out the happy vibes! My sister and I did a little shopping on Second Street last week and stopped into Jo’s Coffeehouse for a yummy Iced Turbo on the patio (hazelnut, iced coffee, sweetened milk…mouth watering as I type this haha), I brought my camera along and she rocked at snapping some outfit pics while we cooled off! 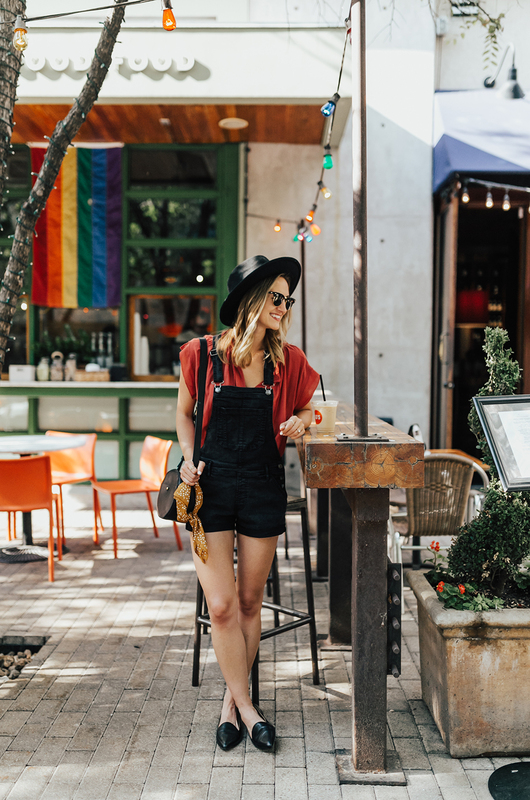 My overalls and that adorable top underneath are both from Abercrombie. Lemme tell ya, their New Arrivals tab for summer is killing it right now! SO many adorable tops, dresses, denim…I went a little crazy and scooped up quite a few new additions (like this yellow dress – now just $29, this top – 50% off!, and this off-shoulder dress – also half off). They’re running a 50% of summer selects sale, so the top I’m wearing above is actually now just $34!! 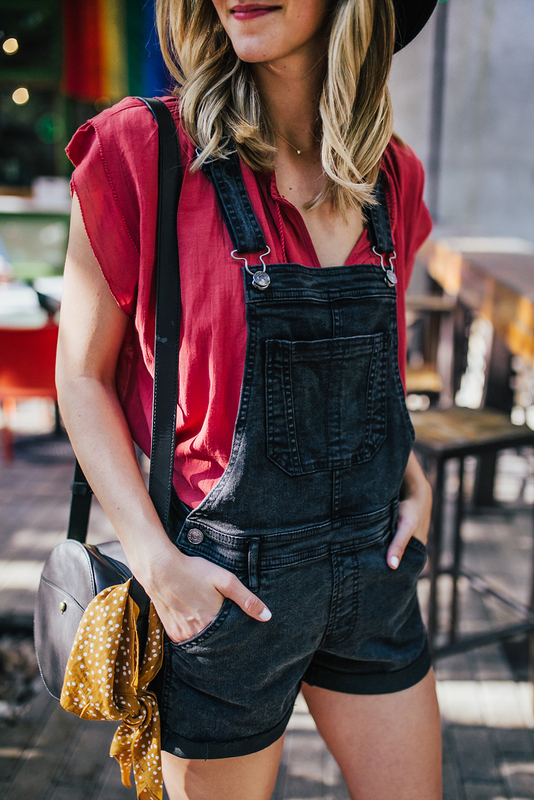 **I am wearing size XS in both the overalls and the top, truly can’t recommend enough!! (I normally wear a 0-2 in denim or dresses and I am 5’6 for height reference). When it comes to summer fashion, I feel like you can never have enough basics lying around! Abercrombie has an amazing selection of cute summer styles to take you from a coffee date to a summer getaway. I also love that most of the colors they carry are subdued or more along the earth tones spectrum…that’s definitely my favorite color palette! You can check out more of their summer selection here. (Psst…SO many great pieces are half off right now!). A big thank you to Abercrombie for sponsoring this post! All opinions are my own. I was wondering when Abercrombie would start sending to bloggers! Haha good for them because this post def makes me want to buy some stuff! Haha agreed – everything is SO cute!! 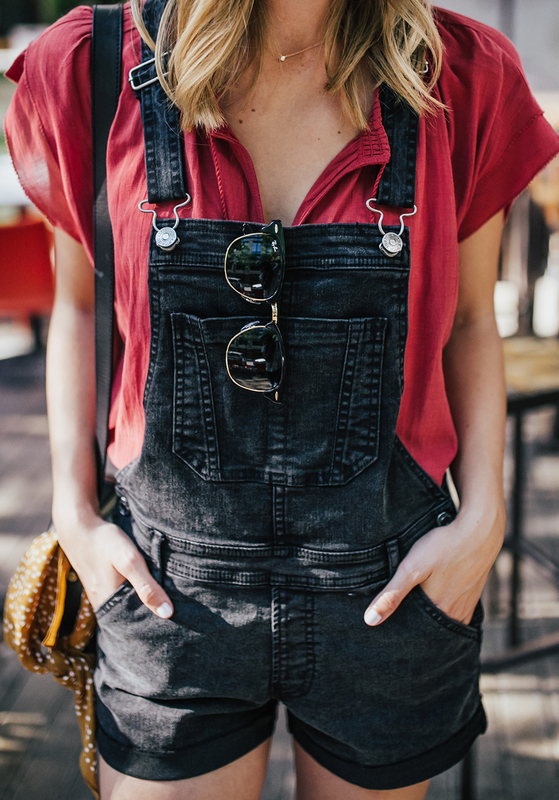 Sucker for a good pair of overalls, too! Hope you have a great week, XOXO!